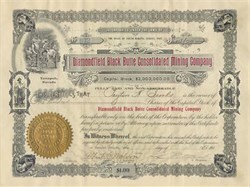 Beautifully engraved Certificate from the famous Diamondfield Black Butte Consolidated Mining Company issued in 1905 - 1907. Tonopah, Nevada is printed on the face of this certificate. This historic document has an ornate border around it with a vignette of miners. This item is hand signed by the company's vice president and secretary and is over 93 years old. The man who signed as vice president was the famous mine promoter L.L. Patrick. Patrick was the second largest mine promoter behind George Wingfield.